The Townsend Center is located on the beautifully wooded campus of the University of West Georgia in Carrollton, GA. Located in the western part of the state, Carrollton is easily accessible from Interstate 20, or Highway 27, or Highway 166. Once in Carrollton, follow Highway 27 or Highway 166 to Maple Street, on the west side of town. 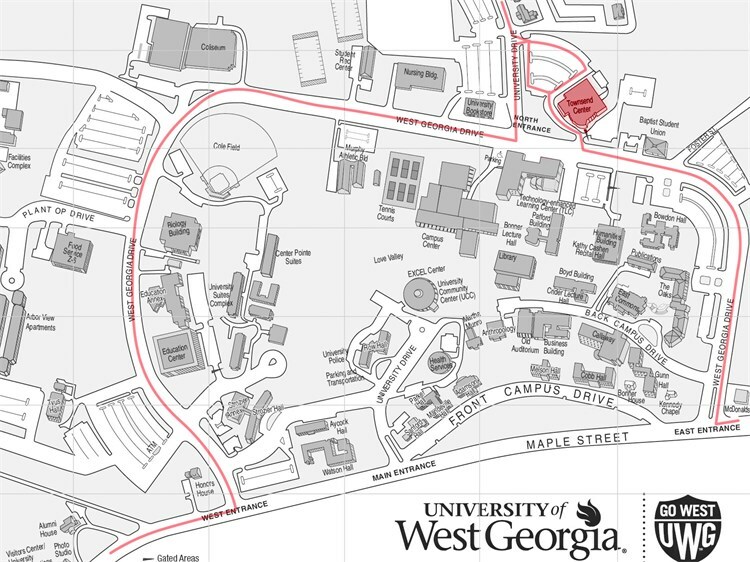 The three main entrances to the campus are all on Maple Street. The Townsend Center is located on West Georgia Drive. From either the East or West Entrance, travel to the 3-way traffic light. The Townsend Center is a multi-level building of beige brick located in the corner of the 3-way stop.